As previous year, I publish a blog post on this special day. In the year 2009, I didn’t commit any crime or have financial problems as well as being offered mega project, so police wouldn't arrest me, loan shark and MACC officer wouldn't knock at my door at midnight. I am just an ordinary citizen without any vision but hope that the distinguished Prime Minister Datuk Seri Najib would implement the 1Malaysia commitment effectively. 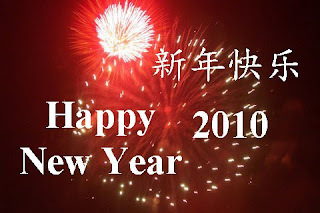 Finally, I would like to wish my blog visitors and friends a happy new year. The Korean stainless steel bowl seems very nice.